On Lawrence Free State’s first possession, quarterback Dallas Crittendon got the ball and unloaded a bomb to Zach Sanders: touchdown Firebirds. Crittendon and the Free State’s offense was lethal scoring touchdowns on the first play of both halves, the first being a Crittendon-Sanders bomb and the second being a Jax Dineen 56-yard scamper as Lawrence Free State (3-2) took care of business at home, winning 35-10 over Olathe South (1-4). Free State’s Dallas Crittendon, Zach Sanders, Zion Bowlin and Jax Dineen fueled the Firebirds to 306 yards rushing and five touchdowns but Free State’s x-factor was Sanders who finished the night with two touchdowns and over 100 yards receiving. Lisher saw his offense as a game changer too. 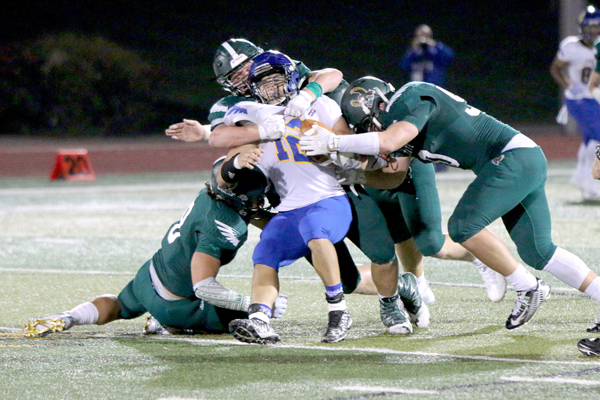 Free State’s offense separated themselves from Olathe South with big plays. South head coach Craig Lewis talked about the Falcons defense that struggled to those stop big plays. “We have to communicate; young guys getting the calls and making sure they do it, so we gotta get better,” Lewis said. “I mean we are a lot better than we were but we still gotta get better. Olathe South’s offense moved the ball efficiently but struggled in the red-zone coming away with just 10 points in four tries. Lawrence Free State looks to ride the momentum at home against Olathe Northwest while Olathe South looks to rebound at home against Lawrence High School.